“Leaders are born, not made.” Right? Let me ask you a question: do you believe that? I’ll give you mine: I *don’t* believe it. Look at the military, businesses, schools and other organizations. They are hiring people who they feel can make a difference. They look for – and find – difference makers. I’ll make you a bet. (1) good, hard study; and (2) applying what they have learned. I’ll tell you this. If you were one of those proverbial “flies on the wall” who was “there” throughout the various stages of my life, you would have noticed a few things. I didn’t act much like a born leader. I took a good, hard look at certain types of people. You know them. The “big guys” and the “little guys” who stand out above crowd in terms of their impact. Most folks don’t think of themselves as a born leader. You *can* become a person who positively impacts the lives of all kinds of people in all kinds of ways. And *that* is what I want you to hear. And if Josh Hinds can, YOU can. Don’t compare in a non-productive manner. Don’t expect too much too soon. Don’t expect a free ride with no obstacles. Don’t stop believing in your potential. And don’t quit looking, learning and taking consistent actions in the right direction. 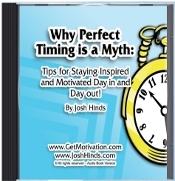 * Josh Hinds is the author of Why Perfect Timing is a Myth: Tips for Staying Inspired and Motivated Day in and Day out! and It’s Your Life, LIVE BIG! -what do you think of the ideas above? Are leaders born or made in your opinion?